Why doesn’t everyone have a bike made from a special metal that weighs next to nothing, rides with a magical smoothness, never goes rusty and lasts forever and ever and ever? It sounds like children’s fiction and indeed my own experience of titanium frames reads uncannily like the beginning of Goldilocks and the Three Bears. I’ve ridden and reviewed a few of them from different brands and, despite the hype, I’ve never really been 100 per cent sold on any of them so far. There was one that should have come with a dental health warning and another that felt a bit like trying to ride a Slinky down the stairs. Too hard or too soft, but so far none that was just right. Until a Ti frame materialised with the letters ‘GF’ on the top tube. So maybe it stands for Gran Fondo not Goldilocks Frame, but was the fairytale about to come true? Kinesis is best known for its aluminium frames — in fact its parent Taiwanese company (called Kinesis as opposed to Kinesis UK), exclusively makes aluminium bikes. But the man behind the British offshoot, Dom Mason, is not restricted to designing in just the one frame material and in 2011 launched the Gran Fondo Ti. 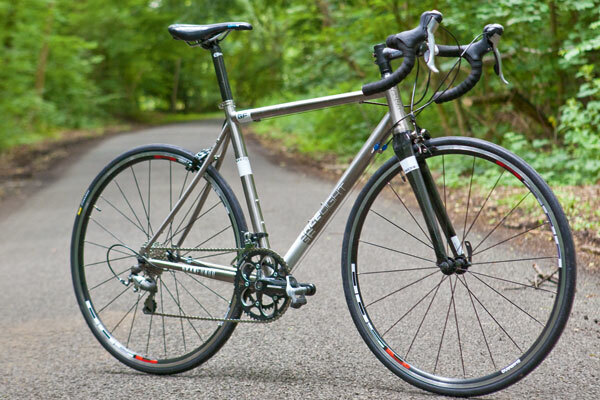 This was a bike based on an existing aluminium Kinesis frame’s geometry that was intended to be ridden all year round. It had mudguard eyes and clearance for 25c tyres, plus rack mounts and a stability that gave it load-carrying capability. But once it had shed its winter coat it was light and sporty enough to be ridden up mountains in the sun for fun. Two years on, Mason has made some small but important revisions to what was his first Kinesis titanium frame and has just released the second version. 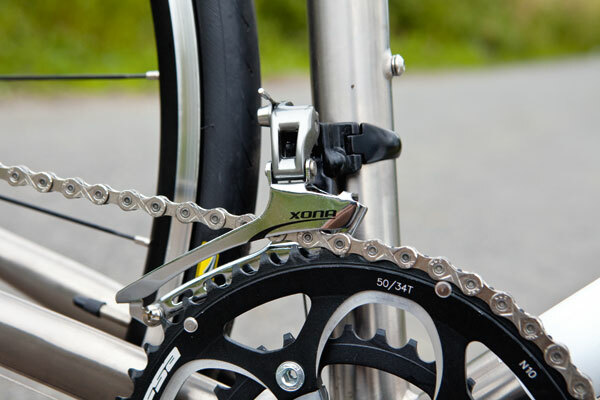 The most visible and detectable change is the inclusion of a tapered head tube. This on-trend piece of technology has been engineered to work with the company’s new Tracer carbon monocoque fork, which takes a 1.5in lower bearing race with 1 1/8in at the top. Kinesis has invested heavily in the front end, and the result is a rather lovely object that can’t really be called a tube as it is machined from titanium billet rather than drawn or rolled. One of Kinesis’s mechanics referred to the standard type of straight titanium head tube as like a “baked bean can”. This new head tube is an elegant vase by comparison, with a shapely waist and an art deco-looking logo stamped into it. The reason for the bigger lower bearing is to give increased stiffness and stability to the steering at speed. But is enlarging the bearing diameter really necessary? That’s a debate for another time, but in this case I would say it helps. I didn’t ride GF_Ti version one, but I read someone else’s review that said that it understeered slightly. I didn’t notice any of that on version two and I did give it plenty of opportunity on a bumpy, steep descent with a bend in the middle that requires some heavy braking — and you can probably put that down to the improved head tube and fork. Elsewhere the top tube has been turned through 90° so that it is laterally oval rather than vertically, as it was in version one. The idea is obviously to stiffen the frame up laterally, which it does successfully. The GF_Ti v2 is still not a super-stiff frame, but as a four-season bike it wouldn’t make sense if it were. The stiffness is sufficient to go up short hills as hard as you can and not feel as though you’re losing much — if anything — to flex, but the emphasis is definitely on smoothness and comfort. 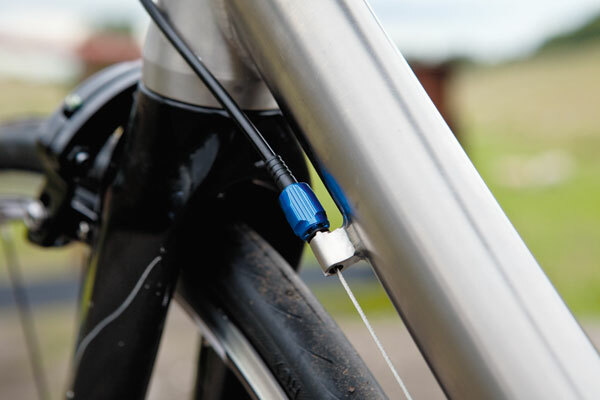 The other noteworthy tweaks involve a bi-ovalised down tube, which means that once the tube is mitred, more material is in contact with the BB shell and head tube for a more rigid join. The BB shell itself has been dropped very slightly for a lower centre of gravity and extra stability — which would be useful with the extra ride height of the 28c tyres that v2 can accommodate. The finish of the frame is exquisite: titanium obviously doesn’t need painting as it doesn’t go rusty, so over the brushed metal there are some subtle white graphics, with heat-cured decals that won’t easily scratch off. You can see the welds, which is a fact of life with titanium frames, but it also means you can see the skill with which this frame has been made. £1,449.99 for the frame, fork, headset and seat clamp is a very fair price for a titanium frame that has been so painstakingly planned and so well executed. Compared to equivalent frames by rival Ti manufacturers it is incredibly good value. But the main thing is that it rides superbly. We tested the ‘four-season build kit’, which sells at £2,069.99. If you want to spec the GF_Ti v2 with your own superior components you could regard this build as a rolling chassis, but for such a relatively small extra outlay it would seem silly not to get the full build. Yes, the frame deserves a lot better but it’s a sign of its quality that with a basic groupset and wheels it still feels like a classy bike. If this were my bike I’d ride through the winter on this spec quite happily. Titanium is a metal with low density, high strength and excellent corrosion resistance. 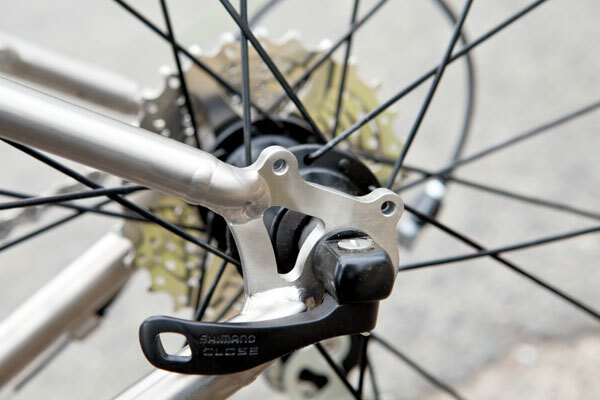 In bicycle frames, titanium is alloyed with aluminium to improve its strength — 6Al/4V and 3Al/2.5V are the most common (‘V’ is for vanadium, which is used to stabilise the material after alloying). The Kinesis GF_Ti v2 is made with 3Al/2.5V. There’s not a great deal of difference between the two but generally 3Al/2.5V tubes are seamless rather than starting out as sheet metal and rolled into a tube, which means they may have consistent properties. Titanium is expensive and relatively complicated to produce for bicycles compared with steel and aluminium, but you’ll have something you can leave to your grandchildren.